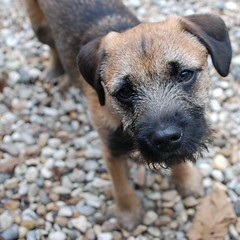 Ernie is our Border Terrier who was one in September. He has changed our lives in many ways, ‘mostly’ for the better. He gets around 2 hours of walks a day which is good for him but also good for us as it gets us out into our beautiful local surroundings and we get to see things that would normally pass us by. Ed and Ernie saw a badger last week and we are much more aware of the changing seasons and that really the weather isn’t usually as bad as we think. The bad points are all to do with the gradual lowering of standards in house cleanliness and the fact that everything has dog hair on, but it’s a relatively small price to pay! Some more photo’s of Ern can be found on our Flickr page. Thankyou Marley, and Matthew. Ernie’s 1st birthday is 26th September. Not sure what one does for a BT’s 1st Birthday, any suggestions?